Brands these days are promoted in several digital channels to create a relationship with the customers, owing to the rapid evolution of Internet. Marketers have understood the scope of marketing through various digital means because of the increased use of digital devices by the potential customers. Is digital branding different from digital marketing? Yes, these are two different terms that are more commonly mistaken as synonyms. 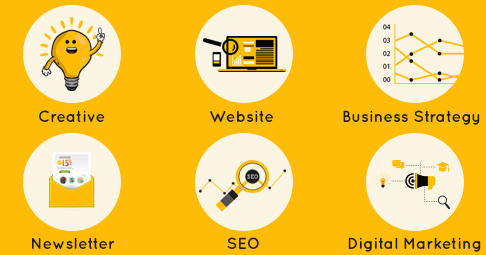 Digital Marketing is the set tools used to promote your business online. This includes SEO, social media, PPC, local search, mobile, and traditional promotional methods and tools. Branding is the way by which the culture, character and message of your business are established and spread out to your audience. As a result of this, your business will create an impression on your audience. Branding done by digital means on digital media platforms to the right target audience is called Digital branding. Branding is the process of making your customers come to you by attracting them. Some of the most successful companies like Apple and Google have had made it this far only because they have established their brands so effectively among their target audiences. Some businesses do not even have a brick and mortar store; they exist only on the digital medium. Take the examples of many apps, E-commerce websites. They all have done good digital branding for themselves because of which the customers trust them. Branding is about being adaptable. You need to adapt your brand to the ever-changing preferences and lifestyle of customers or audience. Digital branding requires a high level of creativity to keep the audience engaged and interactive with your online business. Any action that you do to interact with customers for promoting or developing your business is part of establishing your brand. Branding is the overall strategy that shapes your entire business. It acts as the driving force for your business. Digital is the tool that is used for effective branding. Digital branding is defining the image of your business to the customers and creating an emotional connect with them online. If you communicate your brand successfully, it creates some expectations in the minds of customers. Even before the purchase is made, your customers can have a good opinion or a positive feeling about your brand. The brand needs to interact with the relevant customers in the right approach. It should be impactful to every single customer. You need to win the trust of your customers in the digital medium. This can be done by talking about the experiences you’ve had in the process of establishing your brand. Customers these days are highly informed about the products or services offered. You need to present your brand genuinely as well as creatively so that it interests your target audience. If the customers are satisfied with your digital branding, your brand will become memorable among the masses. Thus, digital branding is more challenging than ever before because retaining the loyal customers is very critical. When there are already many companies that are doing Digital branding the right way, it is possible for you to do great Digital Branding as well! Take your online business to a whole new level by doing impactful digital branding.